"One of the most heartfelt and humble admissions that could be applied throughout the collection, comes in 'Still Life with Lenny Bruce in Jail,' where because 'This whole generation’s strung out,' (meaning, both Bruce’s as well as our own), the speaker watches the late Bruce inject heroin in his arm because 'you don’t care, so I won’t too/As the cop down the hall watches me watch/You shoot up.' Such a line is important, not for the depiction of someone famous and controversial chasing the dragon, but because it illustrates that Long’s speaker is capable of being witnessed—just as we witness Bruce through his eyes, he is, and so are we, witnessed elsewhere. 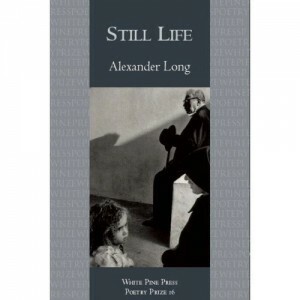 Just as with Long’s Kafka, we look at the subjects of Long’s still lives-in-motion, but we cannot see through him because he undercuts his speaker’s omniscience habitually, opting for the human, the tragically fucked up, and the carelessness-prone over the invisibly perfect..."
It comes as no surprise that Aliki Barnstone would invoke Eliot’s “Tradition and the Individual Talent” when articulating the eloquent and stunning poems in Alexander Long’s third collection, Still Life (Winner of the White Pines Poetry Prize, Vol. 16). Certainly, one of the most disarming of Eliot’s insights is that no living poet can embark on writing or uttering poetic speech without incanting the “significance,” the “appreciation,” or the “value” of what dead poets have written and uttered before him or her. That is, “You cannot value him [the living poet] alone; you must set him, for contrast and comparison, among the dead.” Long, a poet whose work appears heavily influenced by the late Larry Levis (the book is in fact dedicated to Levis in part) seems incapable of avoiding this shadow of influence and intertextuality, and yet, in Still Life, he does not try to escape any shadows whatsoever. He invites and incorporates them into the work and engages them, bullshits with them, accuses them, indicts them, prays to them, and even transforms them in this poignant and beautiful collection. Probably as telling as any line in the book is in this poem, where the speaker identifies that “and when you pass by/I look through you, though I can’t entirely.” That seems to be the greater task in all of Long’s portraits. He treats his subjects carefully, allowing them their autonomy, their candid willingness to be witnessed as fallible and human. Moreover, one of the most heartfelt and humble admissions that could be applied throughout the collection, comes in “Still Life with Lenny Bruce in Jail,” where because “This whole generation’s strung out,” (meaning, both Bruce’s as well as our own), the speaker watches the late Bruce inject heroin in his arm because “you don’t care, so I won’t too/As the cop down the hall watches me watch/You shoot up.” Such a line is important, not for the depiction of someone famous and controversial chasing the dragon, but because it illustrates that Long’s speaker is capable of being witnessed—just as we witness Bruce through his eyes, he is, and so are we, witnessed elsewhere. Just as with Long’s Kafka, we look at the subjects of Long’s still lives-in-motion, but we cannot see through him because he undercuts his speaker’s omniscience habitually, opting for the human, the tragically fucked up, and the carelessness-prone over the invisibly perfect. The greatest chord of Still Life is the nature of who Long decides to write about here—to give motion and rightful admiration to individuals misunderstood, repressed, tortured, beaten, assassinated, self-destructed, and altogether beautiful. Malcolm X, Frederick Douglas, and Abraham Lincoln join the ranks of Paul Celan, Kafka, Hendrix, and Vallejo. This, undoubtedly, sings true of Long’s romanticism, but Long’s treatment of his subject matter is far from the romantic ideal. Like Long’s speaker, his portraits are fractured, broken, and imperfect. One merely recalls the trees in his “Still Life with Birch Trees in Minsk and a Portrait of Pushkin” that are beaten by the wind “into right angles” and may reside as emblematic for Pushkin as well as many others in the supporting cast of Long’s collection. Into the design of a wave that refuses to break. In this example, the speaker likens his own conception as a mere result of his parents “wasting time,” yet, that is the ethos of this collection throughout: the happy accident, the beautiful drunken dance of a couple in love and honeymooning, or vacationing, in Atlantic City. The final couplet of this example, moreover, speaks to the grandest paradox throughout Still Life—nothing is still, even in death, on the page, or in history. Time is merely an impurity to a grander vision, a crack in the already imperfect lens that we share.